The quest system back-end is coming along. I’m sad it’s not further along by now, but life has a way of disrupting plans. The important thing is I’m still making progress and have some good stuff to share today. In this post, I will dissect tasks along with their conditions and actions, which together form the meat of a quest. There’s a great deal of technical content ahead, I want this post to be a kind of primer for contributors to quest system. My apologies to those of you who don’t enjoy code-heavy updates. Before getting started, please have a quick skim through Donald Tipton’s excellent documentation for his Template v1.11 quest compiler/decompiler. As discussed in Questing Part 1: Source, these source files are also used by Daggerfall Unity’s quest parser so we have common ground with classic. This even allows quest source to be shared back and forth with classic for testing. I’ve actually rolled back some of my ideas from that first post and will use Template source files directly as-is without any changes. This might have to change in time but right now I’m aiming for total parity. If you’d like to see some real quest source, you’ll find all of Daggerfall’s decompiled quests in the StreamingAssets/Quests directory (link to GitHub, ignore .meta files). But today we’re just zooming in on tasks and actions to see how these are handled by Daggerfall Unity. Daggerfall quests have four distinct forms of tasks (so far). All of the examples below are from the quest _BRISIEN. Standard – This is a basic task which does not start unless explicitly triggered somehow. The task name (e.g. _invitepc_) is also a boolean symbol which can be queried to see if task has been triggered (i.e. is active). The lines under the task header are the conditions and actions making up that task. Repeating – These tasks execute continuously until the symbol they reference (the boolean state of another task or variable name) is triggered. In below case, the task will persist until _exitstarter_ is triggered. Repeating tasks appear to be triggered automatically at startup. Variable – A variable is really a kind of task with trigger state only. Trigger state may be set/unset by other tasks. At time of writing, Daggerfall Unity will parse through quest source to instantiate tasks and try to match component actions to a registered template (more on this below). Other than being triggered at startup or by other tasks and clock time-outs, a task can have one or more conditions that might cause it to be triggered. For example, if player is in a specific place at a certain time (e.g. Daggerfall at night) then some action can be performed (e.g. play the “vengeance” effect). This makes it possible to chain together tasks which trigger on and off based on the trigger state of other tasks. I won’t go much into conditions right now as they have not been implemented yet. I’ve just barely stubbed out a bit of starting code that will be replaced later. If you like, you can read more about quest conditions here. A quest action is a bit of text that does something. This is usually a single thing like playing a sound, displaying a message, or starting another task. Don’t think of actions like a normal programming command though. They aren’t necessarily run and done (although they might be). Try to think of actions as components attached to a task in a similar way that Unity components are attached to a GameObject. This isn’t a perfect analogy, but its a start. Like GameObjects in Unity, tasks can switch on and off and their component actions perform bits of work over time. Actions are a great way for contributors to help build out the quest system. There are many different kinds of actions, some will be very simple others very complex. So how does an action go from a line of text to actually doing something in the game? The rest of this post will cover the fundamentals and show a real working example of a custom action… in action. Pattern – A regex string used to pair a line of source text with this action. Two actions cannot have the same match pattern. Test – Checks if provided source string matches the regex pattern expected for this action. Create – An action template is special in that it can also factory (i.e. generate) a new instance of itself with default settings. This allows the QuestMachine which hosts active quests to hold a list of self-replicating action templates that can be instantiated as required. GetSaveData – Gets a data packet from action live state. This will be passed on to JSON serialization system when saving a game. ResoreSaveData – Sends a data packet to action from serialized state. This will be used to restore action state when loading a game. Update – Called by the task owning this action. Allows the action to do work every frame as needed. This is just a basic regex match string that looks for a pattern like “juggle 5 apples every 2 seconds drop 40%”. Everything the action needs to execute is contained in the pattern. Sometimes an action might take different forms and the pattern string must cover these variants also. The parser uses Test to find a registered action template with pattern matching source. When a match is found, the JuggleAction template will factory a new instance of itself with default settings by way of Create. You’ll notice the action parameters are exposed directly by the Match class returned by Test. This makes it easy to read out the values involved. At this time, our new action is ready and is added to a collection stored in the Task object. During quest runtime, the task will call Update on each action to do the work required. Here it just counts off time and if still holding any objects, calls the Juggle() method. Note that we’re using Time.realtimeSinceStartup instead of Time.deltaTime. The reason for this is that QuestMachine ticks at a slower rate than Unity (currently 10 times per second). So we need to measure time without using something that only changes frame-to-frame. Below is the Juggle() method for completeness. It just spits out some notification text to HUD and randomly decrements object count until none are remaining. // We might drop something! I won’t touch on GetSaveData and RestoreSaveData yet as quest state serialization has a ways to go. You can check the full source of JuggleAction linked above for an example implementation. You might recall I said something about registering new actions with QuestMachine. This might change later, but right now our action class JuggleAction is registered in QuestMachine from RegisterActionTemplates() like below. The template is only being used as a factory so it doesn’t need to pass in an owning quest at construction. Registering the action template allows the quest machine to find it (using Test) and factory a new instance from the template. Now that we have an action and registered it to quest machine, we actually need a quest that uses this action for real. I created a cut-down quest just for this example called __DEMO01. All that remains is to instantiate the quest itself. I will add a console command soon for this, but in the meantime I’m calling the following bit of code from StartGameBehaviour. 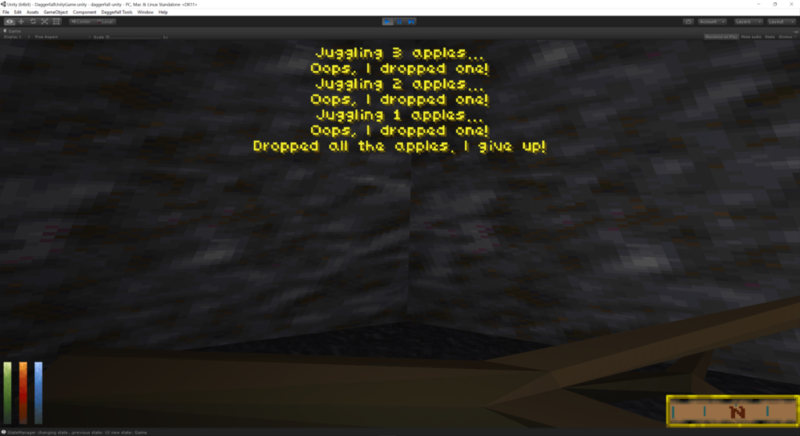 For now, I will continue to work on the quest machine, parser, and related frameworks. My immediate next step will be to get the full tutorial quest working along with some foundation conditions and actions, and a few supporting user interfaces (quest log, quest debugger UI). I would like to invite the more experienced contributors to review the quest source documentation in more detail and see if any actions might fall into their range of interest. I would also love some help with quest resources other than tasks (e.g. Place, Item, Foe, Person, etc.). I’ve stubbed out the Clock resource as a starting point. If there is something you would like to work with, please start a conversation on the forums and let’s see where it takes us. If you have any questions or would like to dicuss this post in more detail, please don’t hesitate to find me on the forums! For more frequent updates on Daggerfall Unity, follow me on Twitter @gav_clayton. Posted in Daggerfall Unity, Technical Content. The quest system looks simpler than i’d imagined, almost makes me want to take a crack at scripting custom quests for daggerfall. Any plans on implementing a front-end for quest creation later on that would generate the quest scripts for less advanced users? No plans for a front-end tool right now. I think just the fact Daggerfall Unity uses source files directly at runtime (no need to compile back into bytecode like classic), it should be possible to build and test a quest directly inside a running game. That could make Daggerfall Unity itself a front end of sorts. Thanks for the heads up! This file was renamed recently. Have fixed link now. Just discovered this project. Tested it out and it’s fantastic. Truly breathes new life into the game and I cannot wait to see the end result. Good luck! We still have a long way to go, but once quests are mostly working, it should be downhill from there.